The appeal, not to mention the importance, of a festival like Emerge that presents new and experimental work by new and experimental choreographers, is the possibility of a work appearing on the program that stands out, that leaves a palpable trace or sensation. It doesn’t mean the work is ready to tour nationally or internationally but simply that it ushers in the possibility of new developments in choreography. Such innovations don’t necessarily require lots of money but they do need to be seen. 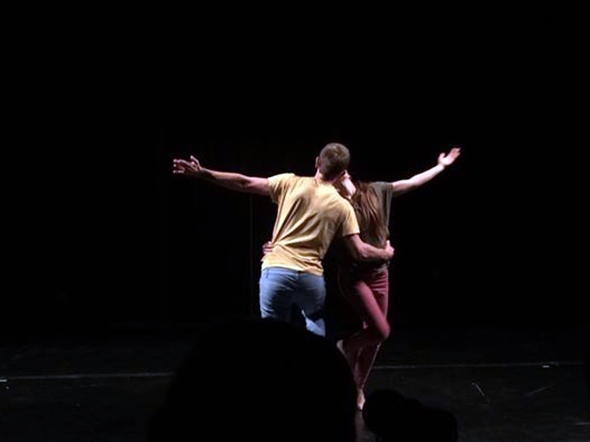 On each week of its two-week run, Emerge’s curator, Adam Towndrow of C12 Dance Theatre, has produced a single program of five works that is performed five times, and there is no connection between the works apart from their intrinsic interest. The little miracle happened in the second week. Most of the works involve a single choreographer but Joe Garbett coordinated eight (Jacob Bray, Daisy Farris, Chloe Mead, Joel O’donoghue, Hannah Parsons, Hannah Rotchell, Thea Stanton and Cornelia Voglmayr) in the work he conceived and directed, No.Company. It’s all about collaboration that keeps the collaborators out of the room, a choreographic form like remote surgery with the haptic feedback coming from the performers. It’s an interesting creative paradigm; choreographic ideas sent by text message — anything from a suggestion, to word play, to a precise instruction — from each of the choreographers and translated by the two interpreters, Garbett and Jessica Haener, into formal phrases. Garbett says the process of interpreting the texts and directing the finished work took three studio days. ‘Finished work’ might be an overstatement; with its fluid, interpretative basis, No.Company has the quality of an improvisation — albeit within restrictions — with the refreshing continuity of a spontaneous conversation replete with asides, pauses, connecting gestures and phrases. I saw it twice and the second time it had matured but not substantively changed. Garbett and Haener are relaxed together, freely and informally engaged in the moment without any indication they know what’s coming up next. Neither do we; the nature of the collaboration is eight unrelated subjects with eight unrelated soundtracks joined together to form a single discursive performance. But because Garbett and Haener are so engaging and the work so full of suggestion, we as an audience can draw our own conclusions like a directorial line. Paul Klee once described his doodles as taking his pencil for a walk; No. Company takes the body for a walk, and in its expressive articulation — even the pastel colours of their clothes help legibility — I have a sense of reading the choreography as it is written in space. Garbett’s governing idea is about the process of creation, but the result is that the eight creators and two translators, through some special alchemy, have created an intriguingly coherent work. Also on the program is a reworking of Pomodoro by Alice Weber. It is a more powerful work than when I first saw it at Blue Cloud Scratch but Weber understandably skirts round the full horror of the experience that prompted it. It is a dark meditation on the vulnerability of the human body to trauma. Using the fragility of tomatoes as a metaphor is a stroke of genius but the potential menace of her conception is susceptible to psychological escape valves that leave the audience unsuspecting and the work unfulfilled. Weber shared the solo with Merritt Millman but even by detaching herself from the work through another interpreter, she maintains a safe distance from the subject. The last time I saw a work by Rhiannon Brace (Baby), she was celebrating the birth of her son, Dylan; in The Last Dance On Earth she has jumped to the other end of the spectrum with the depiction a family living out its final day. Drawn from a reading of HG Wells’ War of the Worlds, we meet the three generations of family sitting listening to the radio announcing the end of the world. Jay Jeyakumar has changed from a teddy-bear father in Baby to a stunned and confused one, but Mary Cox is still the smiling grandmother whose memories transform her movements into optimism. Brace herself is the mother, and Marta Polak the daughter who takes with her all the longing and pluck in her body. It’s a finely drawn characterisation that lifts the miniature work to a level of poignant urgency. Paola Napolitano’s work on mental health, SELphOBiA, has far-reaching ideas that have not yet developed a coherent choreographic language to convey them, nor a setting in which to frame them. How do you convey emotional fragility through a body and mind that are strong and healthy? Napolitano’s imagery stays too much on the surface to convey the psychological depths she wants to explore. A straight jacket can point to a condition but does not in itself convey it, and Napolitano’s use of a broken mirror as a metaphor is similarly too literal; we should be looking through it rather than at it. I am reminded of those harrowing photographs by Richard Avedon of his sister and other inmates in a mental asylum: we see them through his lens and at the same time we feel the his emotional connection. In the theatre we are in effect behind the lens and it is only the physical language of the performer that can create that connection. No easy task, but there is more to unlock here. By contrast, in Amy Foskett’s Through The Cottongrass the choreographic language dominates the narrative. Inspired by the beloved Swedish fairy tale, Princess Cottongrass, Foskett has created an episodic duet with Katherine Whale that picks up on the companionship of the princess and the elk in their magical journey through the forest. Of course in a theatre you can’t go very far, so the various stages of the duet rely for their effect on the quality of physical connection between the two dancers. Their duets create an ever more urgent but always precise and eloquent dynamic that is a pleasure to watch but the narrative basis of the work is only crudely tacked on to either end. The tale is certainly suitable for translation into dance but that, perhaps, is another project. Just a final word to signal the heroic efforts of Edmund Sutton on the lighting desk and of Charlotte Tuckwood for her cameo performances in preparing the stage for each work.